Last week, BuzzFeed UK published a superb article based partly on my investigation of the International Meta-Medicine Association (IMMA), a US integrative medicine organisation that has been blamed for the death of three cancer sufferers. Science journalist Tom Chivers (formerly a writer for The Telegraph) reported that Regent’s University London – a prestigious private university and registered charity – had allowed its premises to be used for a series of events and programmes which promote pseudo-scientific treatments. Earlier this month, Regent’s leased space for a conference by the Lifestyle Prescriptions Foundation, whose founder Johannes Fisslinger – a student of ghoulish German ex-doctor Ryke Geerd Hamer, originator of the discredited Germanic New Medicine – previously ran the disreputable IMMA. Lifestyle Prescriptions was founded by Johannes Fisslinger in 2016; on its website, practitioners of the “lifestyle medicine” it promotes claim to be able to teach how to “prevent and heal diabetes, heart disease, obesity, autoimmune disease, cancer and many other health issues”, and a practitioner claims to be able to “heal cancer”. Chivers also reported that Regent’s was scheduled to host a talk by Samir Chaukkar – an Indian homeopath who believes vaccines cause autism and that autism can be treated with homeopathy – and that last month the university held a screening of Vaxxed, a controversial anti-vaccination film by the disgraced, struck-off doctor Andrew Wakefield. Homeopathy is a pseudoscientific treatment that claims diseases can be treated by enormously diluted preparations of substances that cause the symptoms of those diseases – so onion juice, which causes runny eyes and sniffles, might treat the common cold. The preparations are usually so diluted that no molecules of the original substance remain. A 2010 House of Commons investigation found that homeopathy was not effective for any diseases and described its purported mechanism as “scientifically implausible”. …Chaukkar’s talk, “Kingdoms in Homeopathy”, was cancelled by Regent’s after an autism rights activist, Fiona Pettit O’Leary, rang to ask the university about it. 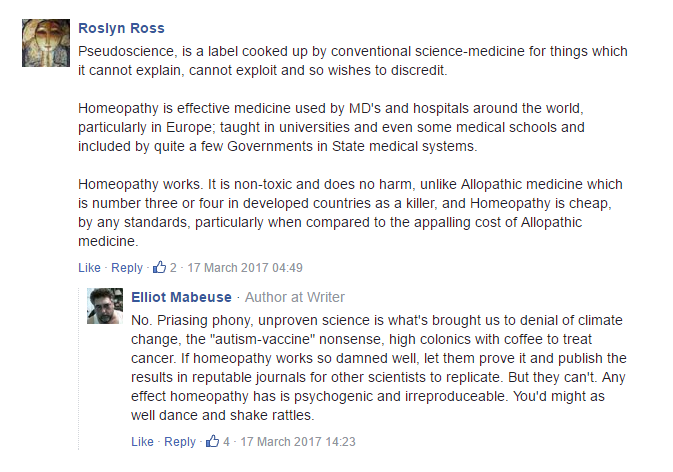 He also spoke at the university last year, in a two-day, £140-a-ticket seminar on how to treat addiction and skin diseases with homeopathy. Earlier this month, I received more angry comments by a proponent of the Germanic New Medicine, Ryke Geerd Hamer’s widely discredited theory which posits that specific traumas correlate with specific physical illnesses – for instance, a woman seeing her child in danger might get breast cancer. The anonymous commenter claimed that my September 14, 2016 item, “The Death of Itziar Orube,” contained “false information”; that Hamer didn’t have his medical licence revoked after his patients died; and that ninety percent of Hamer’s patients actually survived. You have a lot of false information in your note. Hamer did€t loss their medical license for cancer patients death. There are youtube interviews with the “dead patients who say that are alive thanks to their medica practice. In fact 90% of their patients lived 6 years after their treatments when the Dr. Hamer case was in the Germany courts. 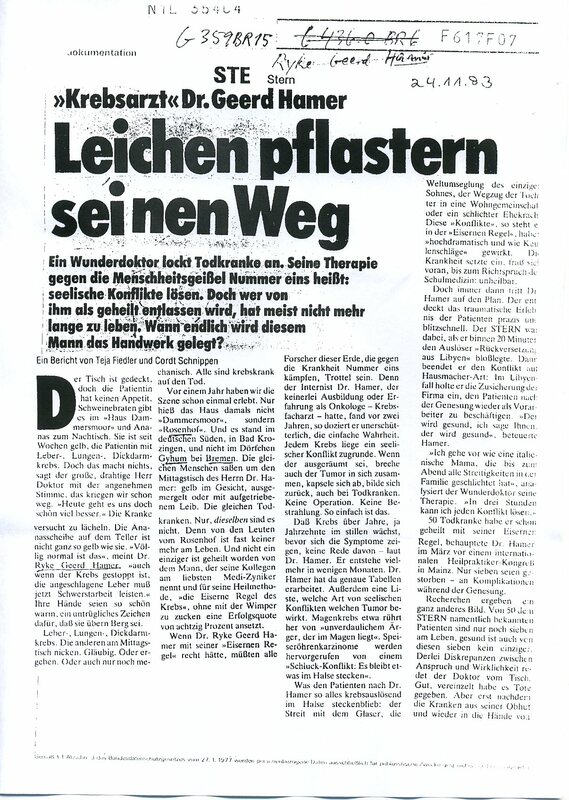 This commenter didn’t provide evidence for their claims, and I was unable to find the video interviews with Hamer’s surviving patients, but here’s a scan of a long-lost November 1983 Der Stern article about Hamer titled “Corpses Pave His Way,” which I grabbed before it disappeared from the Internet. The table is laid, but the female patient has no appetite. Pork roast is served in “Haus Dammersmoor” and pineapple for dessert. She has been yellow for weeks, the female patient with liver, lung, and colon cancer. But that does not matter, says the tall, wiry doctor with the pleasant voice, this will go away. “Today we already feel much better.” The patient tries to laugh. The pineapple slice on the plate is not quite as yellow as she is. “This is completely normal,” says Dr. Ryke Geerd Hamer, “even if the cancer is stopped, the injured liver must now work hard.” Her hands are so cozily warm, an unmistakable sign for her being out of the woods. Liver, lung, and colon cancer. The others at the lunch table nod. Believing. Or devoted. Or just merely mechanically. All are dying of cancer. A year ago we witnessed the same scene. Only the house at that time was not called “Dammersmoor” but “Rosenhof.” And it was in the German south, in Bad Krozingen, and not in the village Gyhum near Bremen. The same people sat around the table of Dr. Hamer: yellow in the face, emaciated or with swollen body. The same deathly sick. Only, it is not the same. Because of those in Rosenhof nearly no one is alive anymore. And not a single one is cured by the man, who calls his colleagues Medi-Cynics and for his method of healing, the “iron rule of cancer,” without batting an eye lid, [claims] a success rate of 80 percent. According to numerous German news sources, Hamer was stripped of his medical licence in 1986, and in 1989 a Koblenz court ruled that Hamer did not possess the mental capacity to grasp the ethical ramifications of treating patients using an unproven therapy. 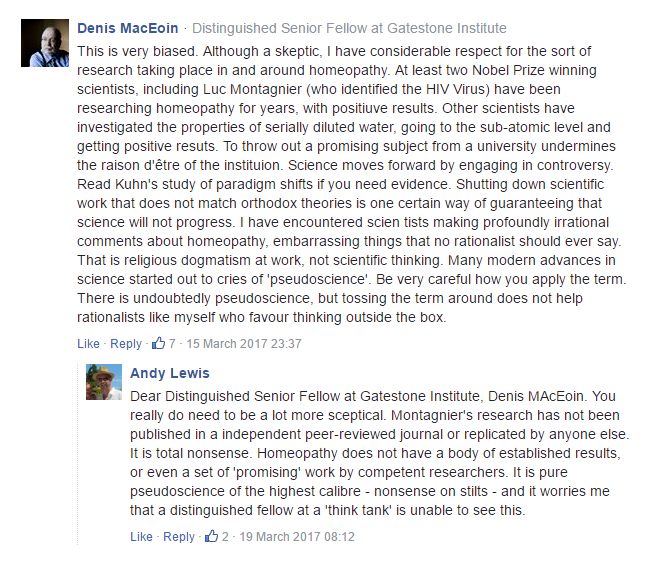 If anyone else feels the need to explain why they think Hamer is a misunderstood genius, or why conventional medicine is a Jewish conspiracy, there’s a great website called WordPress where you can start your own blog. Good luck!